MISS HANNIGAN HAS BEEN CAST. ALL OTHER ROLES AVAILABLE. 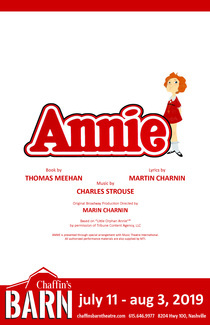 ANNIE AND (6) ORPHANS WILL BE DOUBLE CAST AND ALTERNATE PERFORMANCES-TOTAL OF (2) ANNIES AND (12) ORPHANS. ORPHANS SHOULD BE AGES 6-14, ANNIE'S AGES 10-14. *ANNIE IS 10 YEARS OLD IN SCRIPT. ANNIE'S AND ORPHANS CAST WILL BE REQUIRED TO ATTEND A (1) WEEK MUSICAL THEATRE INTENSIVE CAMP JUNE 17 -21, 930AM - 3PM. CAMP WILL BE LED BY MARTHA WILKINSON AND SOME OF NASHVILLE'S TOP PERFORMERS. THE FEE FOR THIS CAMP IS $200 PER CHILD. ALSO SEEKING A TRAINED OR TRAINABLE DOG TO PLAY "SANDY". *BOTH CALLBACKS WILL CONSIST OF READING & SINGING FROM SCRIPT & LEARNING A DANCE COMBINATION. PLEASE BRING APPROPRIATE CLOTHING AND SHOES TO DANCE IN. NO HARD SOLED SHOES ALLOWED ON DANCE FLOOR.